From midnorthern latitudes, Corvus will be at its highest altitude between 9:30 and 10 pm in late May. Follow the pink arrow to the bright star Spica in Virgo. Thereare quite a few varieties of birds portrayed among the constellations. There isa swan, an eagle, a dove, a crane, a toucan, a peacock, a bird of paradise andeven a mythical phoenix. Overtoward the south as night falls these spring evenings is yet another: Corvus,the Crow. Next tothe famous Sickle of Leo, Corvus is probably the most striking star pattern inthe spring southern sky for those living at mid-northern latitudes. It appearsas a small, moderately bright quadrilateral-shaped pattern of stars; like atriangle whose top has been removed by a cut that slants from upper left tolower right. Add a fainter adjoining star and the pattern resembles the batteredmainsail of a Chinese junk. Corvuscan also be used to positively identify the bluish first-magnitude star Spica,in Virgo. 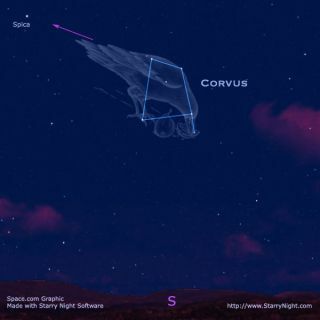 Just follow the direction of Corvus' slanting top to the east (to theleft) and you will soon arrive at Spica. Corvusis supposed to represent the unfaithful raven of the god Apollo. The birdwas sent out with a cup for some water, but instead loitered at a fig treeuntil the fruit became ripe. He then returned to Apollo without the cup, butwith a water snake in his claws, alleging the snake to be the cause of hisdelay. Aspunishment, the angry Apollo changed Corvus from silvery-white to the blackcolor that all crows and ravens bear to this day. In addition, Corvus wasforever fixed in the sky along with the Cup (Crater) and the Snake (Hydra), doomed to everlasting thirst bythe guardianship of the Hydra over the Cup and its contents. Crater,the Cup is a small and rather faint figure, which corresponds quite closely toits name. Its stars outline a goblet, but unfortunately they're hard todistinguish when the sky is hazy or when there's a bright Moon in the sky. A coupleof weeks ago we highlighted Crux, the famous Southern Cross.Interestingly, when the four-sided Corvus has reached its highest point in itscourse across the sky — which this week roughly corresponds to around 9:30 p.m.local daylight time — it stands directly above the Southern Cross, which isalso attaining its highest point above the South Pole of the sky. ThusCorvus reveals the position of a constellation whose name is known to almosteveryone though invisible to many of us. JoeRao serves as an instructor and guest lecturer at New York's HaydenPlanetarium. He writes about astronomy for The New York Times and other publications,and he is also an on-camera meteorologist for News 12 Westchester, New York.